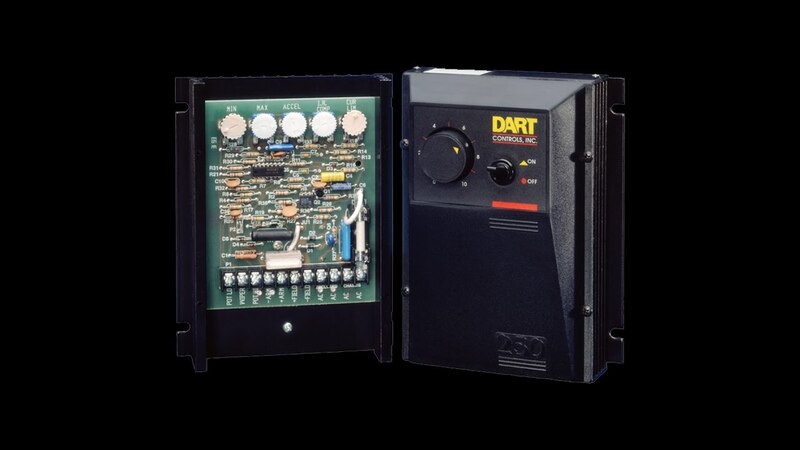 Digital motor speed controls (‘digital controls’) are for the purposes of this discussion microprocessor based, user configurable speed controls for DC permanent magnet (DCPM) motors or digital speed potentiometers¹ for use with AC VFD’s. The digital concept was developed in the mid-80’s to solve a customer need for accurate, repeatable speed control of a pizza oven chain conveyor. These products have evolved over the years into powerful intelligent platforms for controlling and monitoring the speed of one or more motors in a wide variety of applications. ¹Digital speed control is defined as a motor speed control for an AC or DC motor that includes an integrated, programmable display of set or reference speed in engineering units, percent output, time-in-process and/or percent of Master reference. The control may be open or closed loop, where closed loop requires an incremental pulse encoder feedback. A digital speed potentiometer is a motor speed control accessory that when added to a traditional motor speed control (SCR, PWM, Regen, BLDC) will give that speed control the characteristics and capability of an integrated digital speed control defined above. Digital controls are more expensive to build, and therefore carry a higher initial investment for the OEM / MRO customer. However, the net effective cost can reliably be shown to be much less than equivalent options, and in many applications actually save money with very short ROI’s. This discussion will provide examples from actual applications where digital controls have been employed, as well as information for how to evaluate initial investment vs. the expected ROI for a digital control system. Many plants operate today with simple motor control schemes that are primarily manual in nature. Speeds are set using the controls’ speed potentiometer and verified by sight, sound or a pencil mark indicating where yesterday’s setting that was ‘just right’. However, yesterday’s ‘just right’ setting is not the same as todays’. Even this afternoon’s setting is not the same as this mornings’. A manual speed pot setting is just not repeatable. Another (opportunity) cost is not being able to operate equipment or plants at their peak performance levels. Simple control schemes certainly are less complicated and easier to maintain, but a digital control system gives the operator ability to test new levels of performance without losing the proven, safe ‘fallback’ position of operation. In situations where high-value materials are being used the cost saving potential is significant over time. Raw material / throughput / operational efficiencies are lost without the accurate, repeatable performance of digital controls. Motor controls typically offer specifications of 25:1 to 50:1 ‘speed range’. Speed Range is defined as operating speed range of the motor where the control is able to maintain its stated speed regulation (typically 1%). But this is 1% of motor base speed. For an 1800 RPM motor, this means at a 100 RPM speed setting, the actual speed could be as low as 82 RPM or as high as 118 RPM and the control still be ‘in spec’. This speed regulation ‘spec effect’ is pronounced at low speeds. To combat this a gear reducer may be added to the motor. However, the top-end speed of the motor/reducer combination is now lower, which could limit throughput / operational efficiencies. A digital control uses an encoder to know what the actual speed of the motor is at all times; in the example above a digital control would automatically maintain actual speed at or very near the 100 RPM setting. The cost of a gear reducer may be avoided completely. Encoder output PPR (pulses/revolution) can be increased to improve low speed operation, without limiting upper speeds. Hardware and maintenance costs may be avoided by the extended speed range capability of digital controls. One role of factory automation is to provide machine operators with improved information by which they are enabled to make autonomous decisions. Certainly with motor controls we have seen an increase in the use of digital displays built into the control itself, albeit primarily with AC Variable Frequency Drives (VFDs). Digital controls offer an integrated display that is programmable, to indicate speed in rate units (RPM, GPM, FPM), time in process (MM:SS), and in percent output. Digital controls offer a display that will toggle between target speed/time and actual speed/time. This information is extremely valuable especially when working with delivery systems of high value product. The closed-loop enhanced speed regulation can be verified by the operator in actual speed/time display units that are meaningful. Operators are informed and empowered with better information provided by digital controls. When a display in engineering units / time is needed, the traditional solution has been to purchase a separate meter or tachometer. The panel space and additional wiring costs of a separate meter are avoided by having the display integral to the control. The integrated display also offers a means to display and communicate process alarms, system errors and other information both visually and (with alarm relay output) audibly if so desired. Example – digital controls can accumulate operating hours of a pump motor, and alarm on reaching the point where preventive maintenance is needed. The cost of a separate display is more than offset by the incremental cost of a digital control. The integrated design offers access to more process and control system information. The ability to connect a control directly to a network offers tremendous advantages at both the machine (OEM) and plant operations level. The Internet of Things (IoT) /Factory 4.0 are concepts that are rapidly becoming reality as product designs evolve to embrace and participate in these environments. Machine Level – OEM designers increasingly employ plc’s, HMI’s and microcontrollers in their designs to manage, execute and coordinate machine functions. When a motor is involved, these devices typically use outputs to start, stop and adjust the motor speed automatically without manual intervention. The suppliers of these HMI’s and controllers offer native serial interfaces. But traditional motor controls require an analog signal (0-10Vdc / 4-20mA) to automatically adjust motor speed. To get this, an additional option card and other hardware to support it may be required of the HMI/ controller, at an additional cost. Digital controls offer serial interface options that allow for complete configuration, control and monitoring via a simple network ‘drop’ or connection. When more than one control/motor per machine is involved, the savings in hardware and installation costs really start to add up. Direct network interface to digital controls offer the distinct advantage to adjust control parameters to match equipment performance with the particular product being produced, automatically and without operator action. This further increases product quality and equipment throughput capability, important metrics for the designer. Plant Level – The ability to network digital controls in the plant saves installation cost. Most network protocols support addressing / multi-drop functionality, which means a single network cable can be routed through the plant as opposed to direct connections from the host controller to each individual motor control. The savings are surprisingly significant. Network cabling is inherently less susceptible to electrical noise interference as most if not all network cabling uses shielded wire. As well, the advantages of complete configuration, monitoring and control are available with digital controls in the plant. Digital controls offer better performance, more flexibility, shorter setups and turnarounds, and less installation cost when considering all hardware, wiring and labor. Water treatment plants use polymers as a coagulant aid in the water treatment process. Polymers are expensive and used in low dosages. Because they are expensive, even a small over dosage can be expensive. A 25% polymer solution costs $800 – $1,000/gallon. These are diluted prior to dosing to a 0.5% concentration, for a ‘ready to use’ cost of $16-$20/gallon. An example dosing rate is 5 GPH polymer per 36,000 GPH water. The three Digital control error rates were used to illustrate the potential ROI prior to purchase, to help justify the additional Digital control expense. Actual error measured by customer was < 0.075%. While the hardware cost of a digital control (motor speed or speed potentiometer) is higher, the total installed cost when adding a digital display to a traditional motor speed control is only slightly less. Perhaps more importantly the Opportunity Cost / Cost Avoidance aspects of a digital control system for many applications make it a better value choice. Every motor speed control application has its unique requirements and budget limitations. Some are best served using a digital speed control or control accessory (digital speed pot) when the assessing the true net effective cost.